← So much for a holiday! So here I am, sitting sideways on a canvas seat in the back of a military aircraft (C17 transport) flying at 32000 feet somewhere over the Atlantic on route for Sierra Leone some three hours away pondering ” what in the world have I got myself into”? It’s a nice thought though as the challenges ahead excite me as much as they scare me. So let’s go back and see how the story unfolds thus far…. My day job is working with the East of England Ambulance Service mainly in the recruitment, training, education and mentoring of frontline staff from Emergency Care Assistants (ECA) to Paramedics. I have been with the “East of England Ambulance Service” for 28 years mostly as an operational frontline paramedic and love my job. I saw an advert (can’t remember where) asking for NHS staff to volunteer to help fight the Ebola outbreak in west Africa. So thinking to myself, yep I could help, I volunteered through the UK-Med website and having completed the online application form I duly underwent a telephone interview and face to chat in London with the UK-Med team. One thing led to another and due to my years of experience in the Ambulance Service I was shortlisted to help another organisation the King’s Sierra Leone Project” part of King’s College London. They required a volunteer on the ground in Sierra Leone helping to coordinate the Ambulance Service response to Ebola in the capital city, Freetown. The applicant would be primarily working in the Ebola Command and Control Centre in Freetown coordinating and mapping all patient contacts, resource allocation, running the call centre, organising the burial teams, resupplying the Ebola Treatment Centre’s (ETC) and pretty much anything else that came down the line. The applicant must be ready to go within 5 days! So I duly applied (having discussed it with my wife Wendy first (She is the ultimate boss and has the final say on most things!) and had multiple jabs two days later , Yellow Fever, Typhoid, Hep A, Malaria etc (yuck). A rapid fire sequence of phone calls by the Department for International Development (DFID) saw me booked on the early Saturday morning flight from Brize Norton to Sierra Leone! Due to the seriousness of this trip I hastily arranged to update my Will and duly travelled up to North Norfolk Friday morning to make any necessary amendments. Most of Friday afternoon was spent on the phone to the Trust’s Public Relations department as on a positive note any hands on experience I can get in Sierra Leone helping coordinate the Ambulance Services response may benefit our Trust back in the UK. Public education in knowing what to do and what not to do if there think they may be infected is crucial in controlling the spread of this horrible disease. 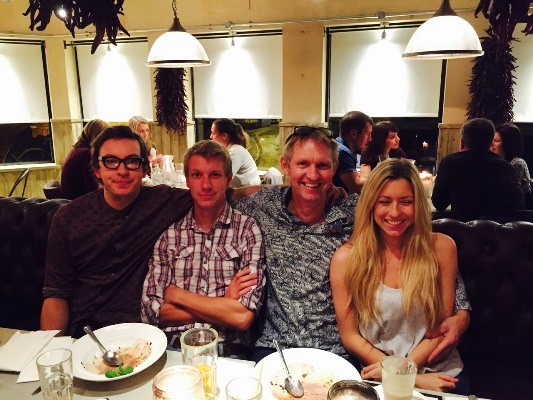 Following a quick discussion Friday afternoon with Wendy and my three children Elliott (24), India (21) and Ethan (17) we decided to go out for dinner in Norwich Friday night as a sort of send off and come back safe. Joined by their partners Sarah, Sam, Shannon and our best friends Mandy and Rob the ten of us enjoyed a lovely evening wining and dining at Bill ‘s in Norwich. We ended the night on a somber note watching a recent documentary (16th Oct 2014) by the New York Times following the life of an Ambulance Crew in Monrovia the capital city of Liberia which is a neighbour to Sierra Leone. The 7 minute film tracks the desperate plight of both the public and the Ambulance crew as dead bodies are left in city streets, people too fearful to move or touch them in case they died of Ebola. It also shows the misery these people endure as when a patient with suspected Ebola is taken to an Ebola treatment centre the Ambulance crew discover it is full and their patient cannot come in. With no other option they take the 17 year old girl home where she dies a few hours later. It is now 00:30 on Saturday morning and time to leave Norwich and make the 200 mile journey to Brize Norton. My check in time is 04:00 for a 07:00am flight. Wendy sleeps fitfully on the way down and we eventually arrive at Brize shortly after 4am exhausted from the journey and the dire lack of sleep. Following a speedy check- in where the young lady asked “What flight are you on”?I answered “The Sierra Leone flight”. The look on the girls face spoke a thousand words. Wendy and I then cuddled up on two uncomfortable chairs in the departure lounge surrounded by squaddies in camouflage kit! A TV report on the news announces yet anther new case of Ebola in a new country (Mali). A two year old girl has the disease having crossed over the border from Guinea. The fight to control/contain and defeat this disease is going to be a long one and one that the whole world needs to address. After a tearful goodbye at 06:20am my wife leaves and I board the C17 Transport/Cargo plane ready for take off. We are all handed out ear plugs as the noise in the back of a C17 with the four engines on full throttle is deafening. At 7:20 am the captain announces that there will be a short delay as one of the four engines won’t “fire up! A quieter journey possibly with three but not worth the risk of dropping in to the Atlantic on route. All off the plane, back into the terminal and a rapid text to my wife to come and fetch me as the planes going nowhere today. Bless her she had never actually left Brize Norton and had been sitting for an hour at the end of the runway (legs crossed) waiting to wave me off as we flew overhead. Long story short she then went to see her Brother and his family in Oxford whilst I waited in the terminal to see if the mechanics could start up the troublesome engine. Eureka, they could and at 09:20 we were on route to Sierra Leone as we taxied down the runway a quick “I love you wife” phone call and then we were airborne. It was then that all but one of my squaddie companions on the plane broke out mats and sleeping bags and bedded down for the journey in between the cargo in the hold! Not to be outdone I decided to join them and spent the next three hours laying on the aluminium floor in the belly of this huge aircraft trying to get some overdue sleep, now I know how Jonah the whale felt! Despite the roar from all four engines I actually slept four three hours! On waking up at 13:20 I was invited up to the flight deck of the C17. An amazing schoolboy dream come true. I know that when we land in Sierra Leone my mod will fluctuate with the enormity and scale of the tasks that lay ahead so I just enjoyed the moment, total peace. Sitting up there on the flight deck looking at the clear blue sky above and the broken clouds below I thought, my wife Wendy would like this, I wonder what she is up to at the moment….. This entry was posted in Ambulance Service and tagged ambulance service, Ebola, Sierra Leone. Bookmark the permalink. Good luck Pete. I think you’re doing an incredible thing. Your family must be proud and terrified in equal measure. Every person on the ground will help to make a difference. Keep safe..
Good Luck Pete. Very proud of you. Take care and come home safe. Thank you all for your kind words of support. Working here is like stepping in to the gates of hell. Ebola can be beaten but they need help here. They needs hundreds on volunteers, trained cleaners, EMT’s, Paramedics, Nurses, Doctors, lab Technician. The list of trained personnel required here is huge but with enough people Ebola can be beaten. Here I sit in Newmarket Station on a break, having just come across your blog… Its an amazing task you are taking on Pete and I wish you all ‘the best of British’ and soon home to us again on the bench at Carrow Rd …take care mate! Hi Pete.. Hope your hard work and commitment will make a difference to life there. Life will be diffrent out there and frustrating at times, so dig deep and keep positive, and we look forward to seeing you back in the fold.